Those property investors chasing yields would have been disappointed over the last year as rental growth has been low and investment yields have been dropping. Of course this is not unusual in the upturn phase of the property cycle, at this stage rental growth always lags behind capital growth. Over last year while capital city rents for houses increased by 2.9% and units rentals grew by 3.4%, dwelling prices increased by around 10%. 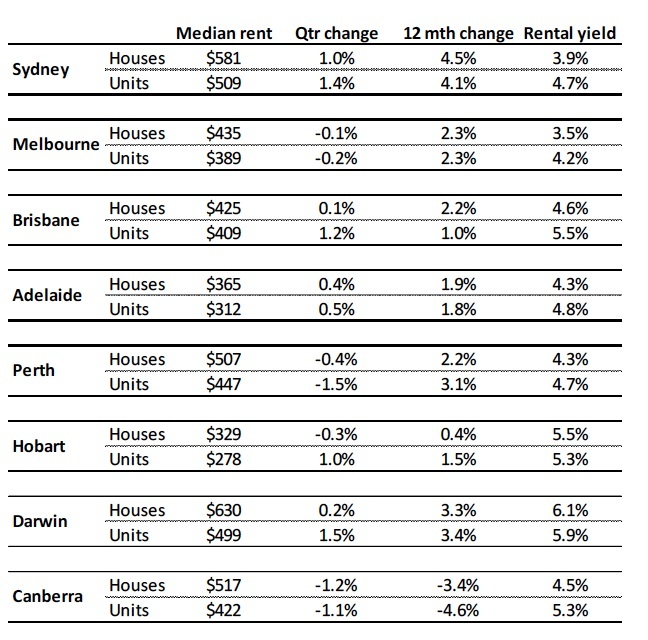 Rental growth strongest in Sydney. As you can see from the table below rental growth has been strongest in the Sydney property market driven by strong demand at a time when lack of construction of new apartment complexes for the last few years caused a shortage of available rental properties. This was good news for Sydney property investors who not only enjoyed strong capital growth but also experienced some of the highest yield available around the country. However with an estimated 6,000 apartments to be completed in Sydney this year and around 25,000 apartments across 130 projects projected to be completed in the next five years could put a damper on rental growth in parts of the Harbour City.